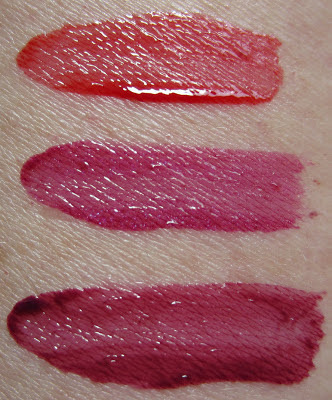 L'Oreal's latest lip color offering, Color Caresse Wet Shine Stains, are available in 12 shades. They are very similar to the much pricier Yves Saint Laurent Rouge Pur Couture Vernis à Lèvres Glossy Stain. The L'Oreal product retails between $7.49 and $9.99 (0.21 fl. oz. 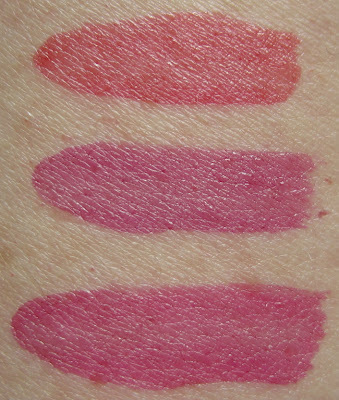 ), depending on where you buy them, while the YSL product retails for $32.00 (0.20 fl. oz.). Let's take a look at the L'Oreal product first, and then I've done a little comparison to the YSL product at the end. 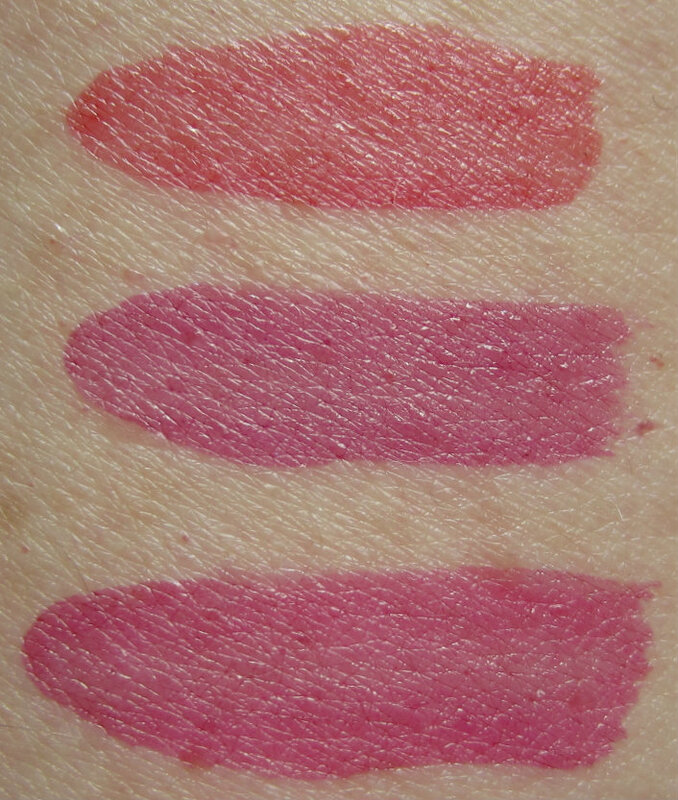 The shades I selected were Endless Red #190 and Berry Persistent #186. The case is a shiny gold plastic container with a color band that shows a representation of the shade. The cap is a locking twist-off type. The applicator is a soft angled foam that is a good working size for both coverage and precision during the application. 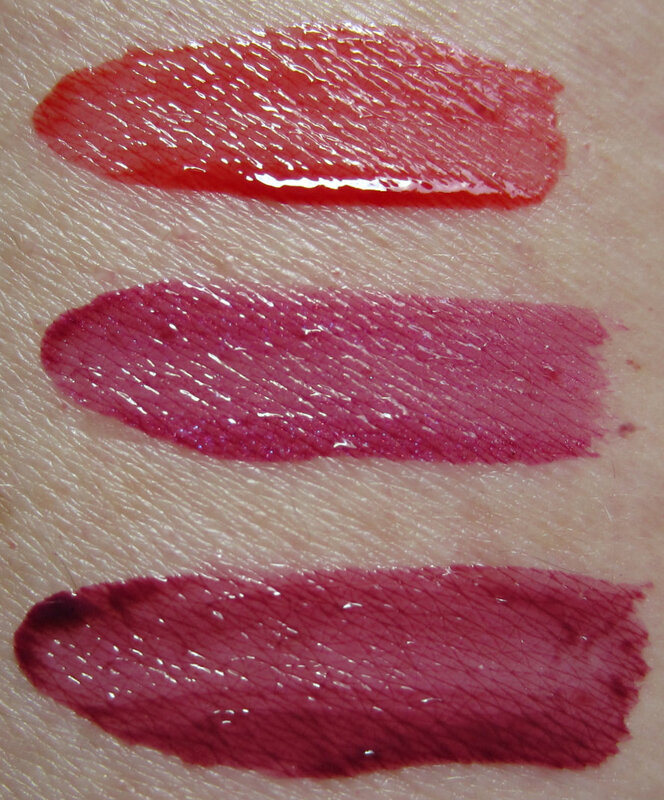 The darker shades are quite pigmented, and my swatch below shows the color coverage with just one swipe. I didn't pick up any of the lighter shades, but I have read reviews that say several coats are needed on those lighter colors for decent coverage. These apply with a glossy finish and they set up pretty quickly. You can blot them down immediately for a fairly matte finish, or allow them to wear down by themselves for that matte look. Over time, they become more of a stain than a matte, and I can still see the color stain after 5-6 hours. This gel-stain product is formulated with hydrating oils and pure color pigment, and they're 30% water. They're tacky feeling at first, and as they dry down they still have a very slight tacky feel to me. They don't dry my lips out, but I think if I wore them for days on end, they probably would. How similar are they to the YSL product? In my opinion, they're very similar as far as the formula. The ingredients are almost identical, they feel identical and wear almost the same. The YSL product seems slightly more pigmented on application, and after leaving them on my arm all day, the YSL product is about 10% more pigmented at this point. 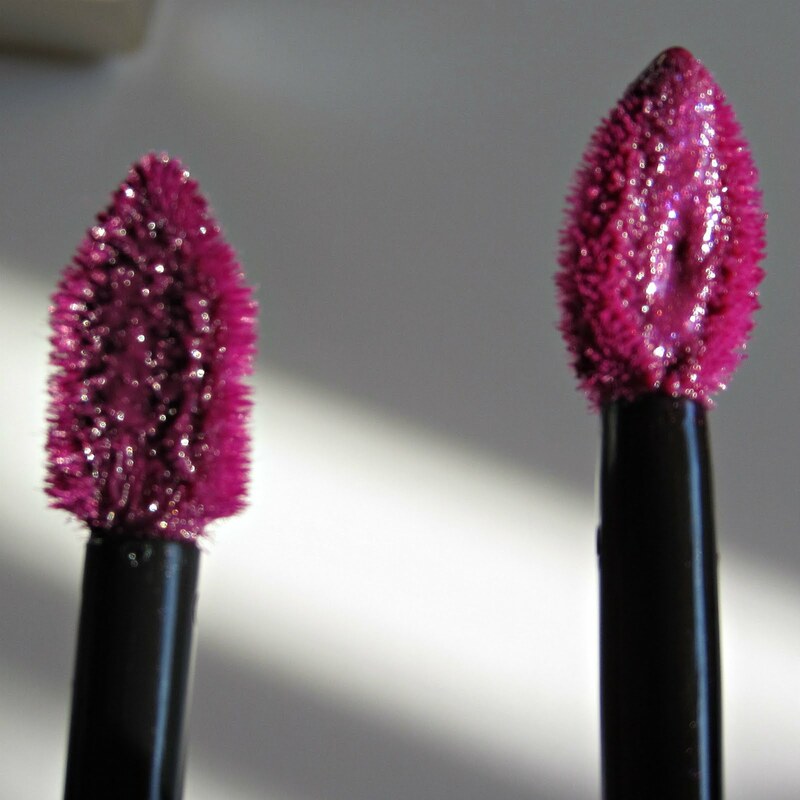 There are some outward cosmetic differences to the packaging and the applicator, and of course there's that huge price difference. 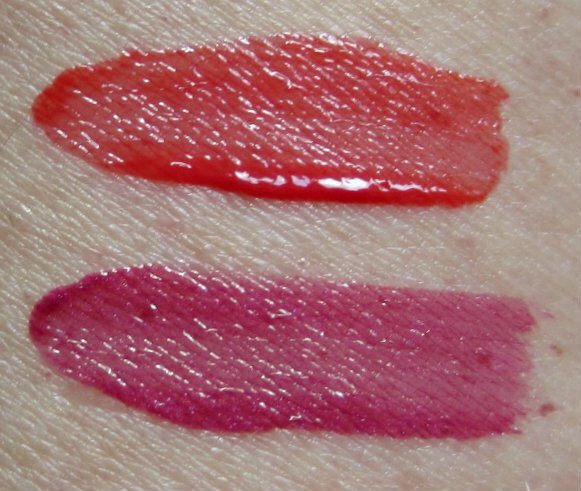 The YSL tube is wider, while the L'Oreal tube is more slender. The applicator wand is slightly longer on the L'Oreal product, and the sponge applicator is actually plusher and cushier on the L'Oreal than on the YSL. L'Oreal's applicator also is more rounded on the sides. I don't find that either design however, does a better or worse job applying the product. Here's a look at the L'Oreal products with the YSL product at the bottom. 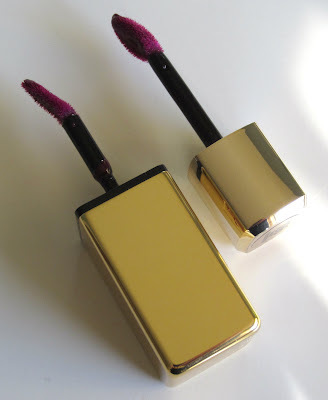 For reference, the YSL product shade is Violet Edition #1. Here are the same shades blotted down after the application. 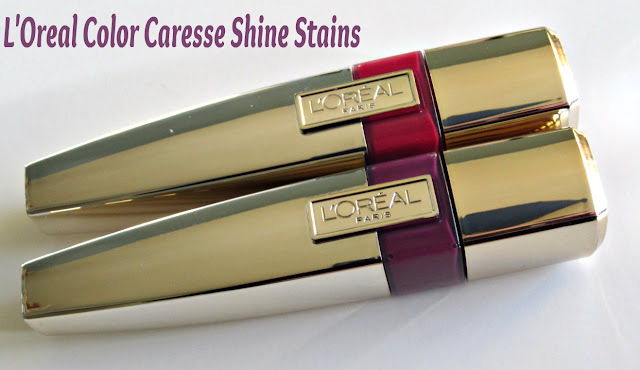 If you're looking for a more reasonably priced alternative to the Yves Saint Laurent Glossy Stains, I don't think you'll find a closer alternative than L'Oreal's Color Caresse Wet Shine Stains. 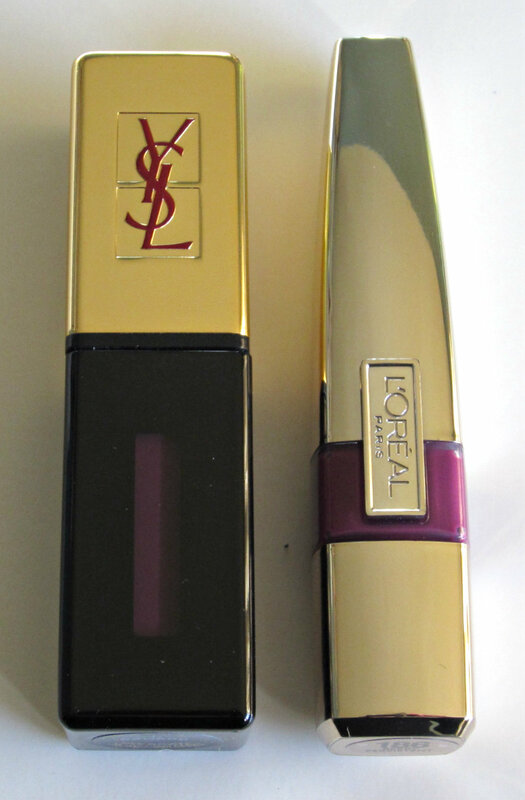 The ingredient lists on these two products are practically identical, and L'Oreal owns YSL. Are they dupes? For all intents and purposes, I would say that they are. I doubt you'll ever see bogo 50% on the YSL, as you're sure to on the L'Oreal, making L'Oreal's product the better deal by far. Don't get me wrong, I still love the YSL Glossy Stains I have and I may buy more in the future. 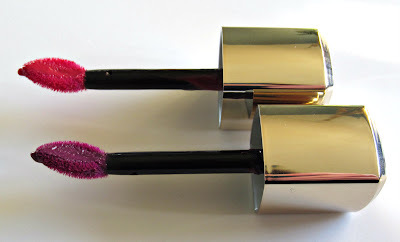 At this point though, I would probably buy another YSL based solely on color if it was something I loved and the L'Oreal Color Caresse Wet Shine Stain didn't have a match. Have you picked up any of the L'Oreal product yet? Let us know what you thought about them, and if you have any YSL, how do you think they compare?